Letting the juices of life (or food) drip from my chin! I am back from a trip to Maui with my family and it has been hard to reenter real life again. It had to be done though, and now we have sweet memories to look back on. I was looking for an easy recipe to make that did not mean going to the store for stray ingredients… this one fit the ticket and it is another winning recipe from the brain of Ina Garten. This recipe is from Ina’s cookbook “How Easy was That?” (link) on page 120 I adapted it to serve my family of five. Warm a small sauce pan with the olive oil over medium heat. Add the minced garlic and cook for about 1 minute, but don’t let it brown. Turn the heat off and add the white wine, lemon zest, lemon juice, oregano and thyme. Pour these into a large Pyrex baking dish. Dry the chicken breasts with paper towels to remove excess moisture. Season each chicken breast with salt and pepper and drizzle each lightly with olive oil. Place them into the baking dish. 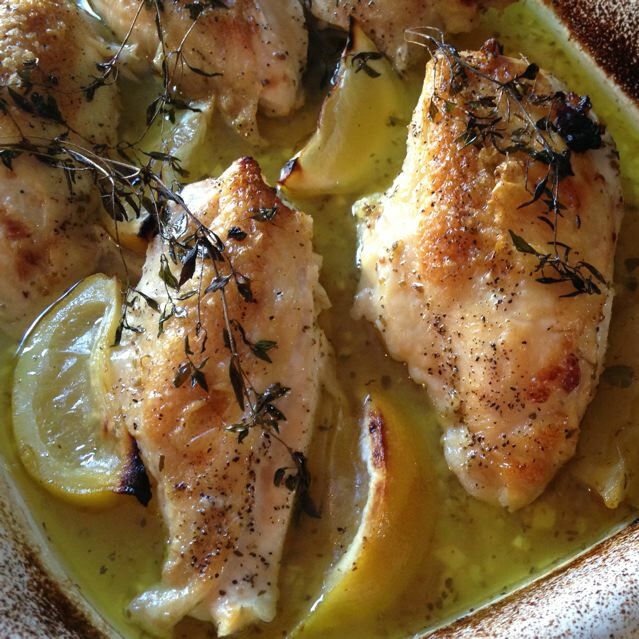 Tuck the lemon wedges between the chicken breasts. Bake for 30-40 minutes or until done. If the chicken skin is not browned place it under the broiler for a few minutes. Remove from the oven, cover with foil and allow to rest for 10 minutes. Serve with a fresh vegetable and rice or risotto. Categories: Ina Garten, Main Dish, Main Dish - Chicken | Tags: Easy Chicken Recipe, Ina's Lemon Chicken, Lemon Chicken Breasts | Permalink.